S SUNINESS Submersible LED Lights, Waterproof Multi Color Battery Operated Remote Control Wireless 10-LED Reusable Underwater Pond light Party,Vase Base,Wedding,Christmas,Aquarium,Pond(4Pack) | Fountain City Art Ctr. Reusable: Operated by 3 x AAA batteries,Easy to replace,save money for you. 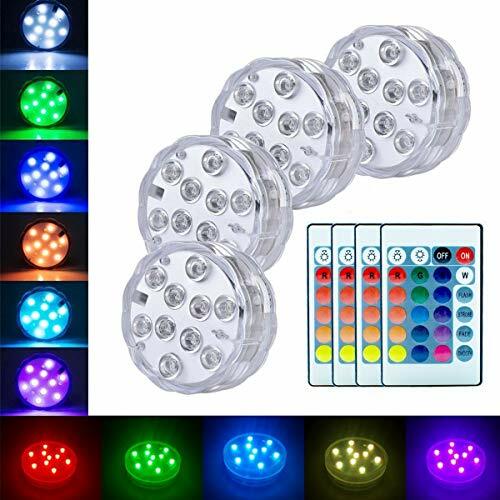 Multi Color: Super bright 10 led built in,4 dynamic color changing modes, 16 different colors in static modes. Waterproof: The LED lights are made of high quality double waterproof materials,Don't worries about that when submerged. Remote control: Wireless design,IR remote control,dimming and ON/OFF. Multi-Purpose: Great for flower vases,pool,fish tank,wedding,Christmas, party or other occasions. * Make sure that screw up the cap clockwise properly and tightly before throw it into water. * When the battery runs out,the lights stay stuck in red,if no longer switching between colors and remote stop work,then please replace the battery. * The max.depth to reach is recommend to be less than 2m. Reliable customer service,respond within 24 hours,30-day money refund guarantee,1 year replacement warranty and lifetime support guarantee. WATERPROOF: High-quality IP68 waterproof materials,perfect for lighting any water filled containers.4.5v Low voltage low heat,no worry about overheat. REUSABLE & WIRELESS: The submersible led lights operated by 3 x AAA batteries,it will run from 10-12 hours,Easy to replace.IR remote control,dimming and ON/OFF. Unique Design and RGB: Special flower design makes the pool lights more attractive when lit up,super bright 10 led built in,4 dynamic color changing modes,16 different Multi Colored lights. Multi-Colored :Party/event illumination,holiday accent lighting,Indoor and outdoor,home accent lighting.Flower design,transparent cover,16 colors Changeable：Red Green Blue Purple Cyan Yellow White underwater submarine lights. Perfect Decoration Lighting: The submerge lights not just for underwater decoration!They can also be used as vase bases,bird bath,solar fountain,swimming pool,table centerpieces,tea lights, wedding,party,stage,Halloween,disco,shopping malls,jewelry stores,showrooms,showcase, centerpiece, cabinet,museums,shops,aquarium light fixture,fish Tank light,family bulbs and other occasions. If you have any questions about this product by S SUNINESS, contact us by completing and submitting the form below. If you are looking for a specif part number, please include it with your message.